Although the temperatures around here have been slightly above normal recently, each day for the next week we have snow or sleet or rain or freezing rain forested for Kharkiv which should prove to be a lot of fun. Since we have weather related excitement coming our way I thought I would show one of the highlights of Kharkiv often mentioned in guide books of Ukraine. 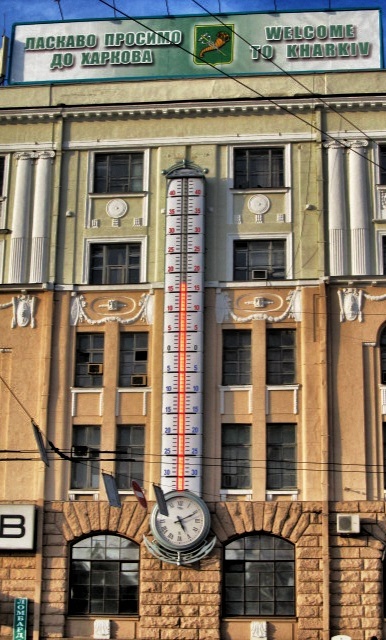 This giant thermometer is on one of the buildings overlooking Constitution Square and is often used as a meeting point for friends or people on dates. As you look at it you can't help but notice that it goes to -35 below zero Celsius. Look at the weather history of the area it looks like we have at least one time a year where the temperature dips that low and I'll have to be sure to try to grab a photo of the red light just slightly above the clock.